EDITOR’S NOTE: Updated at 4 p.m. EDT (2000 GMT) after end of spacewalk. With plans for the first all-female spacewalk derailed by suit sizing issues, astronauts Christina Koch and Nick Hague floated outside the International Space Station Friday for a revised excursion to help fix a solar array battery problem and to connect a second set of replacement batteries as originally planned. When that work was complete, they ventured out to the far left end of the station’s solar power truss to attach additional handrails in preparation for the eventual replacement of yet another set of batteries. The spacewalkers accomplished all of their objectives and wrapped up the six-hour 45-minute excursion at 2:27 p.m. EDT. Hague and crewmate Anne McClain ventured outside last Friday to complete the set-up of three new lithium-ion batteries. McClain originally planned to join Koch for the second EVA this week — the first by an all-female spacewalk team — to install a second set. Hague then planned to venture back outside April 8 with Canadian astronaut David Saint-Jacques to carry out other maintenance work. But the sizing of the station’s available spacesuits became an issue. Only one of the four available suits aboard the station — serial number 3008 — is currently configured with a medium-size upper torso section. Suits can be re-sized in orbit, but changing the fit of an upper torso requires repositioning coolant lines and other components and then retesting the systems, a process that takes about 12 hours. McClain wore the medium last week and initially planned to wear a larger suit for the second spacewalk while Koch used 3008 for the second spacewalk. But McClain decided after the first outing that she preferred the medium. Given the time needed to re-size another suit, she opted to delay her second outing until the medium suit was again available. So Hague took her place and joined Koch for the second spacewalk. McClain will replace Hague during a third excursion April 8, joining Saint-Jacques. While the crew reassignments were unusual, all four astronauts will end up with the same number of spacewalks as originally planned: Hague and McClain with two each and Koch and Saint-Jacques with one each. McClain was the 13th woman to walk in space since cosmonaut Svetlana Savitskaya became the first in 1984. Since then, 12 American women have followed suit with McClain and Koch the 13th and 14th. When another opportunity for an all-female spacewalk might come up again is not yet known. While it remains a possibility, it will depend on the makeup of future station crews, the work required and who’s available to do it. 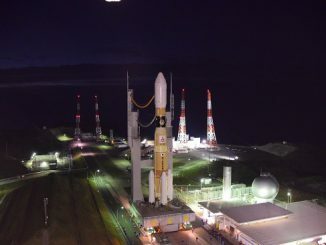 NASA is in the process of replacing the station’s 48 older nickel-hydrogen batteries with 24 more powerful lithium-ion power packs carried up aboard Japanese HTV cargo ships. 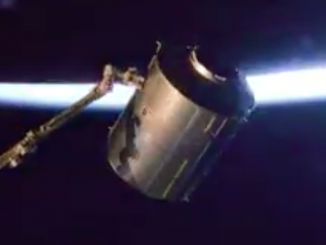 The first two sets of batteries were installed by flight controllers operating the station’s robot arm. Because one new battery replaces two of the originals, the astronauts have to install 75-pound adapter plates to fill all the open slots in the integrated electronics assemblies, or IEAs, at the bases of the station’s huge solar wings where the batteries are housed. They also must connect cables to tie the new batteries into the station’s electrical grid. Twelve older batteries in the inboard IEA on the right side of the station’s power truss were replaced in 2017 with six lithium-ion units. 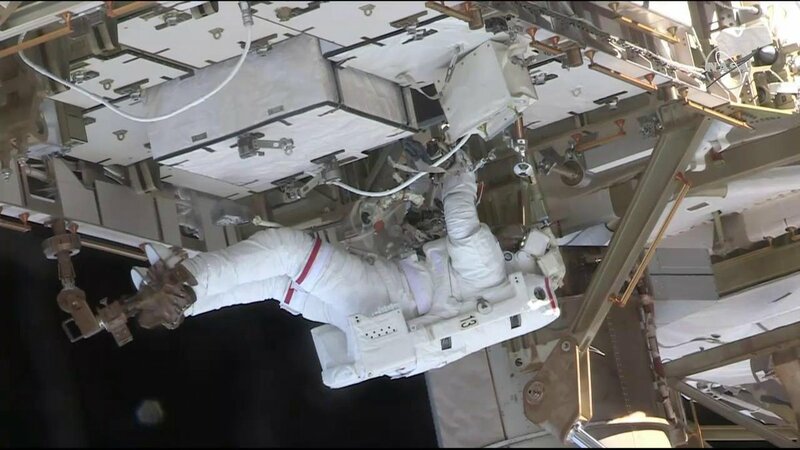 The spacewalk last Friday was aimed at installation of three adapter plates and cable connections to hook up three new li-ion batteries in the inboard IEA on the left side of the power truss. Hague and Koch completed the installation of another three adapter plates and made the necessary connections to three robotically installed li-ion batteries. “Must be a great view,” Pesquet commented as the station passed along the coast of South America on a southwest-to-northeast trajectory. After the first spacewalk last Friday, engineers had problems activating one of the new batteries. It’s not clear whether the battery is at fault or an associated electronics box that controls battery charging when the solar arrays are in sunlight. After installing the new adapter plates and moving one of the older batteries to its storage location, Hague disconnected the cable connecting the suspect li-ion battery to the power grid and loosened the bolts holding it in place. After the spacewalk, flight controllers will use the robot arm to remove the suspect battery, re-install two of the older batteries and install a replacement battery controller. That should restore the affected power channel to normal operation. 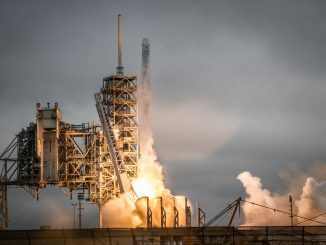 Depending on the result of subsequent tests, either the charge-discharge unit or the battery may be returned to Earth aboard a SpaceX Dragon cargo ship for troubleshooting and repairs. McClain and Saint-Jacques will finish the battery installation work during the April 8 spacewalk and carry out other maintenance activities as originally planned.